The following is a statement issued by Serve the People San José, which initiated the Feb. 8 united-front action that included activists from Party for Socialism and Liberation, the Green Party, Silicon Valley De-Bug, and other groups. 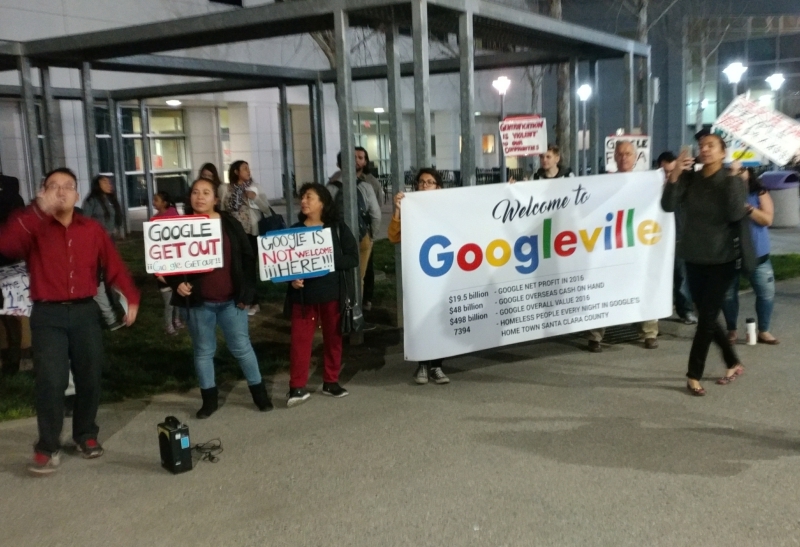 San Jose, CA – The San Jose City Council has voted to continue the development of the Google project despite the cries of working people, people of color, immigrants, and other marginalized communities. Activists protested the Mayor’s State of the City event both inside and outside. Inside, during the Mayor’s speech, activists interrupted him every three minutes shouting “SAM LICCARDO / NOT MY MAYOR,” “SERVE THE PEOPLE / SERVE OUR NEEDS / SAM IS SERVING GOOGLE’S GREED,” “SERVE THE PEOPLE / NOT YOUR POCKETS,” and “SAY IT LOUD SAY IT CLEAR / GOOGLE IS NOT WELCOME HERE.” Three minutes was chosen because every three days a houseless person dies in Santa Clara County. Additionally, a satirical flyer was distributed before the event to mock Liccardo’s stance on Google. The media has labeled the activists as “hecklers” rather than “concerned commuity members” in an effort to dismiss the action altogether. 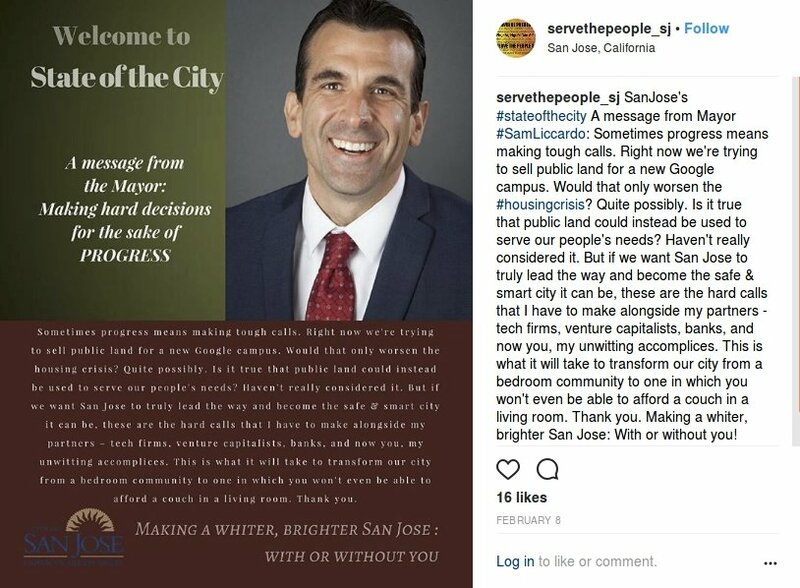 Mayor Sam Liccardo has not done enough to address the housing crisis in San Jose, and this negotiation will make it radically worse. His legacy has been one that has routinely aligned itself with corporate interests rather than the will of the people—the ones who reject the Google developments because they understand its detrimental impacts on rent, wages, and quality of life. Recently, the San Jose City Council voted 10-1 to continue the project as they approved the Station Area Advisory Group (SAAG). The purpose of this group is to negotiate a fair deal for the sale of land around Diridon station to Google, yet the composition of SAAG is one of business elites, housing development groups, and other groups who are removed from the realities of the lives of people of color, workers, migrants, and other marginalized groups. Google is present in SAAG—a conflict of interest. Many people advocate for greater representation in SAAG without realizing they are begging for bread crumbs. In the past, land negotiations between cities and giant tech companies have resulted in meager concessions that have failed to compensate for the displacement caused by thousands of highly paid tech workers moving into the city. In Mountain View, Google initially agreed to build 10,000 housing units, then rescinded the offer, and only followed through with the deal after significant community pressure. We should not be at the mercy of tech companies.